you get the 1.0.0-23 driver then you need the kernel module to have the 1.0.0-23 version as well. you need to download 3 rpms to get your wireless to work!!! In my case I have the 2200bg internal wireless so grab the latest rpms availible. Click the Hardware Tab and see if you card is there. shows up there. If not Reboot & continue on from this point. Network name (SSID): click the Specified and type the "name of your network"
to reboot the system because you made changes to the configuration. After all router adjustments and the software is installed, log out and reboot you machine. "Assign IP Address Automatically" box then Click OK.
Hopefully that gets you up and running with your wireless! 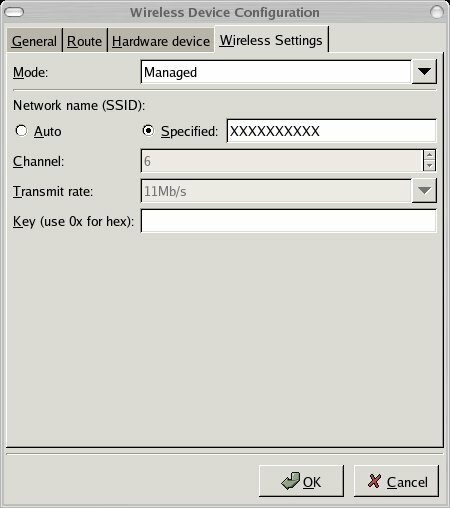 You have to broadcast the SSID in order fo you to connect VIA Wireless. Hopefully this will be an item that can be fixed in future releases.